An alternate version of our previous NCH2. 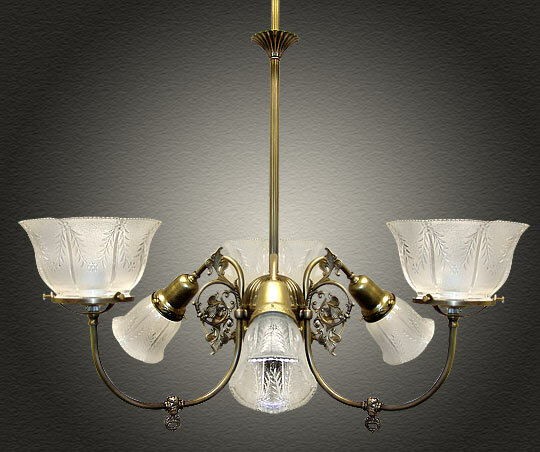 Shown here in Antique Brass, an 'Up and Down' period authentic reproduction of a vintage gas electric light fixture. The statement of this fixture has made it one of our most popular models. Complete with realistic gas key, this model offers plenty of light and outstanding design! Also pictured with a lovely 4in. and 2in. 'Wheat Glass'. Solid cast brass construction. Shown in Antique Brass. Available in different Metal Finishes, different Glass, Back Plate, more or fewer arms, arm direction, tubing style and many other Custom Options.